My prefight article on the Floyd Mayweather Jr. 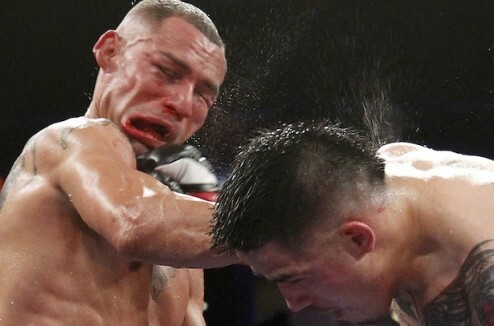 Vs. Robert Guerrero fight. In Esquire. This entry was written by Poole, posted on May 3, 2013 at 5:32 pm, filed under Boxing. Leave a comment or view the discussion at the permalink and follow any comments with the RSS feed for this post. My latest. In TIME. 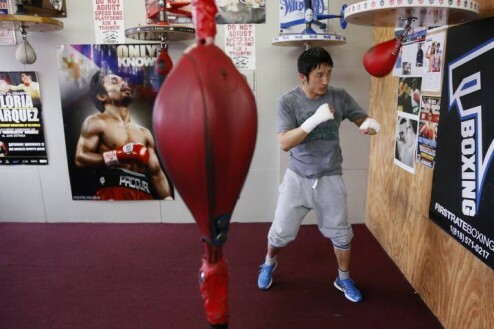 A profile of boxer Zou Shiming. This entry was written by Poole, posted on April 5, 2013 at 12:59 pm, filed under Boxing. Leave a comment or view the discussion at the permalink and follow any comments with the RSS feed for this post. My latest. On boxing. In Esquire. This entry was written by Poole, posted on March 18, 2013 at 5:22 pm, filed under Boxing, Concussion. Leave a comment or view the discussion at the permalink and follow any comments with the RSS feed for this post. Brandon Rios Vs. Mike Alvarado. My take. In The Atlantic. This entry was written by Poole, posted on October 14, 2012 at 12:47 pm, filed under Boxing. Leave a comment or view the discussion at the permalink and follow any comments with the RSS feed for this post. 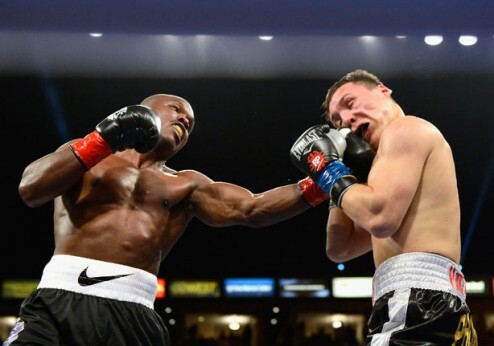 Why Were There 2 Competing Boxing Matches in Las Vegas This Weekend? 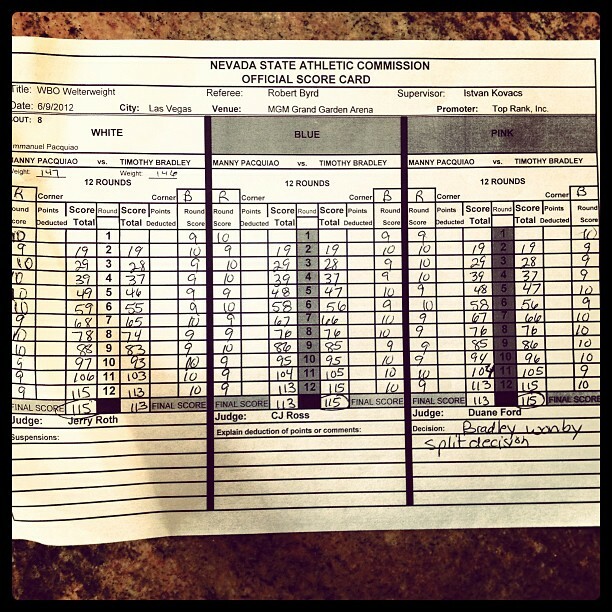 Sergio Martinez vs. Julio Cesar Chavez Jr. My take. In The Atlantic. This entry was written by Poole, posted on September 16, 2012 at 12:41 pm, filed under Bob Marley's Top Pound-for-Pound Fighters, Boxing. Leave a comment or view the discussion at the permalink and follow any comments with the RSS feed for this post. This entry was written by Poole, posted on June 11, 2012 at 10:13 am, filed under Bad Decisions, Boxing, PacMan. Leave a comment or view the discussion at the permalink and follow any comments with the RSS feed for this post. 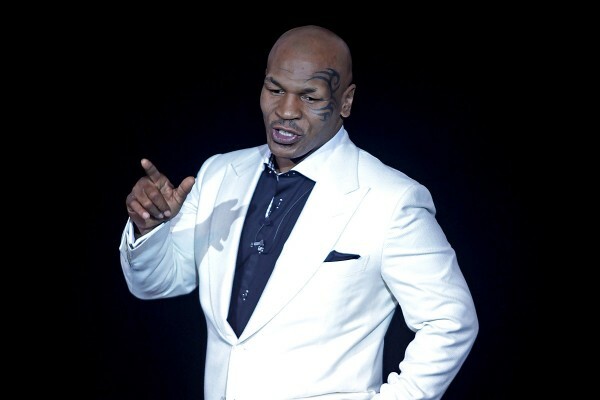 This entry was written by Poole, posted on June 9, 2012 at 1:48 pm, filed under Boxing, Uncategorized. Leave a comment or view the discussion at the permalink and follow any comments with the RSS feed for this post. 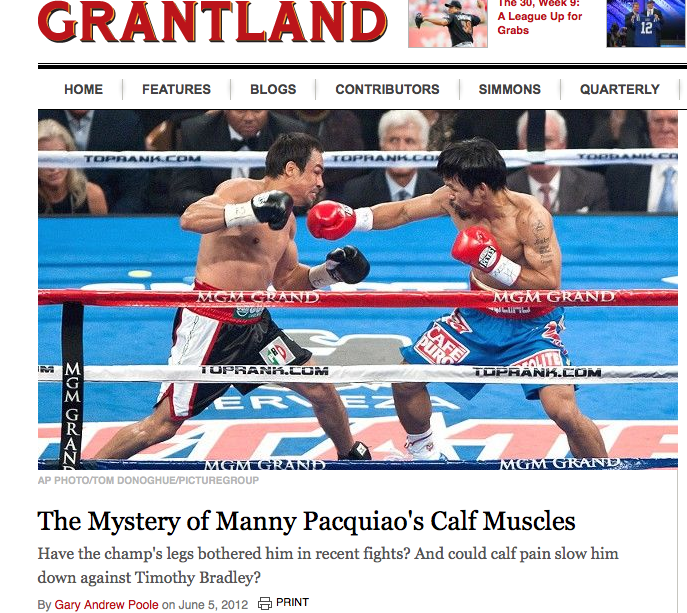 My biography of Manny Pacquiao’s calves. 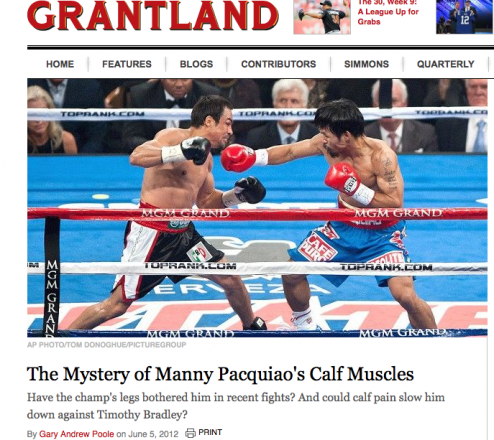 In Grantland. Read it–here–then–stretch! This entry was written by Poole, posted on June 5, 2012 at 1:26 pm, filed under Boxing, Grapefruit-sized Muscles, PacMan. Leave a comment or view the discussion at the permalink and follow any comments with the RSS feed for this post. 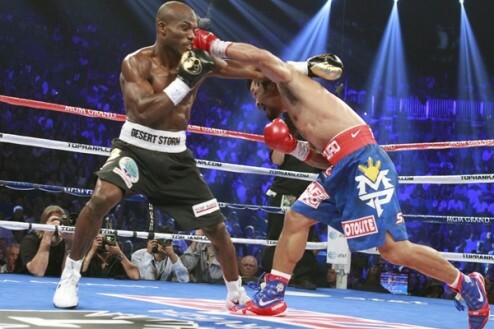 My stories in Esquire and The Atlantic and Esquire Philippines about the Mayweather-Cotto fight. And Justin Bieber. 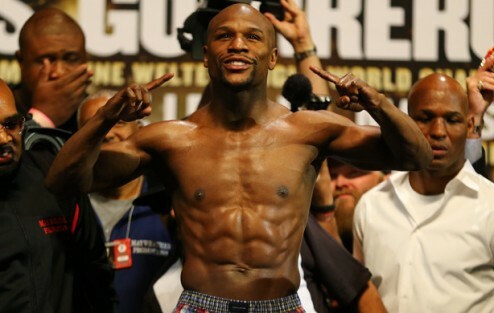 LAS VEGAS — So there was the boy Justin Bieber, side-stepping his way toward the ring alongside the nutjob Floyd Mayweather Jr., and no one really knew what he was doing there yet. It was the biggest fight of the year, and Lil Wayne and 50 Cent were there, too, but it was Saturday night at the MGM Grand, and who needs an 18-year-old human shield when you’re the self-anointed best boxer of all time, when you’re not even afraid of going to jail next month? And anyway the boy looked like he was a little upset with the whole experiment. Like a sucker. This entry was written by Poole, posted on May 7, 2012 at 10:20 am, filed under Bieber Fever, Boxing. Leave a comment or view the discussion at the permalink and follow any comments with the RSS feed for this post. Mike Tyson in a one man show. In Las Vegas. My review. In TIME. Here. 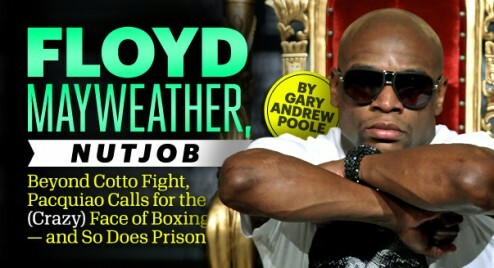 This entry was written by Poole, posted on April 17, 2012 at 1:30 pm, filed under Boxing. Leave a comment or view the discussion at the permalink and follow any comments with the RSS feed for this post.